With Unity, Cinnamon, and Gnome 3 getting all the buzz, it's easy to overlook other interesting projects that attempt to rethink the traditional desktop metaphor. Case in point, the KDE Plasma Netbook interface. Despite its moniker, the KDE's alternative interface is not limited to netbooks, although it's designed for devices with small screens. KDE's alternative interface has been around for a while, but I only recently started using it as a primary environment on my trusty ASUS Eee PC 1005HA netbook, and I grew fond of it for a number of reasons. For starters, KDE Plasma Netbook is surprisingly snappy. Even on my 3-year-old underpowered netbook, the interface is responsive enough for daily use. More importantly, it offers several customization options which can be used to configure the environment to your specific needs. KDE Plasma Netbook replaces the regular desktop with so-called pages of different types. By default, the interface has two pages: Search and Launch and Page One. The former provides quick access to all installed applications, while the latter uses the newspaper layout that can be populated with your favorite widgets. You can, of course, add other pages, if needed. To do this, click on the Plasma logo (Cashew) at the bottom of the page and click on Add Page in the configuration bar. In addition to the Search and Launch and Newspaper Layout, the system offers two other page types: Folder View that displays the contents of a specific folder and Desktop that acts as a regular desktop. This ability to add multiple pages of different types gives you a lot of flexibility when it comes to customizing your computing environment. 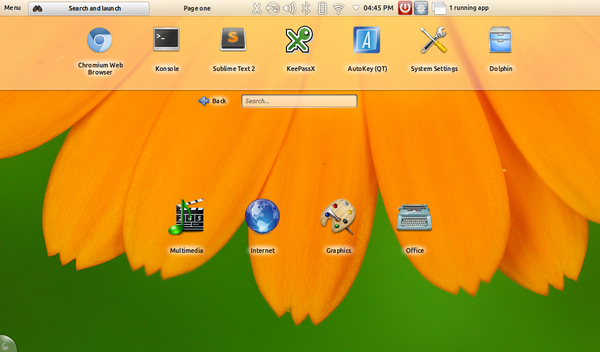 KDE 4 also makes it easy to switch between the netbook and regular desktop interfaces. So you can use the netbook interface when you are out and about, and then switch to the full-blown desktop when you connect an external display to your machine. To switch between interfaces, go to System Settings | Workspace Behavior | Workspace and pick the desired interface from the Workspace Type drop-down list. All of this, as well as a slew of other nifty features, makes KDE Plasma Netbook a viable alternative to existing graphical desktop environments. So whether you want to give your old netbook a new lease of life, or you're thinking about trying something different, KDE Plasma Netbook definitely deserves a closer look. Thats what I want. An OS that changes according to my needs. I dont use my desktop like I do my laptop or 9inch netbook. I like being able to switch from netbook to full OS. heck, my wife only uses it in Netbook mode on her 14inch laptop and shes happy with that. After seeing videos of the KDE Plasma UI for tablets like the Vivaldi, they have taken that idea to another paradigm. Id wish programs also offered this choice to have full featured UI or just a beginner-newbie one that would only offer the most used features with an option to change to a full service look at one click of button. I have been using it on my desktop for quite some time now and I can only confirm that it's a very usable, fast, stable and beautiful desktop interface. But I cannot find where I would start and stop them. an alternative interface for larger computers. Quite right, Unity, Cinnamon and Gnome 3 battle is putting a shadow over KDE Plasma Netbook. It's great and I use on my HTPC because of clean looks and easy navigation on a big screen.